Frank and Eva Tolway along with their children traveled from Poland to Alberta in 1927 where they took up farming. Frank's two brothers also made the same journey and settled in the area. Frank and Eva's children Ludwig, Ada, Evelyn, Adam and Mary made the journey with their parents and welcomed siblings Walter and Edmund in Canada. The Tolway children attended school at Preston Lake, Mary died in 1929 and is buried in the Hay Cemetery along with some of her Tolway cousins who had all contracted scarlet fever. Adam Tolway was born in Poland on the 12 of July in 1922 and started working as a Sectionman for the N.A.R in 1942. 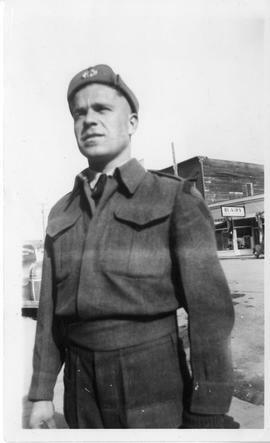 On April 1, 1943 he joined up as a NRMA Soldier (National Resources Mobilization Act which meant he joined the military but is to remain in Canada) during WWII. Adam attended Basic Training in Grande Prairie and after was stationed at Prince George, B.C. In June of 1944 he decided to join the Infantry and was sent overseas. Adam served as a private with the Calgary Highlanders and a few months into his service he was killed in action on September 22, 1944. Adam was initially buried at Wommelgem, Belgium and later was moved to the Bergen op Zoom Cemetery in the Netherlands. Donated by Mary Fowler, a cousin of Adam Tolway. 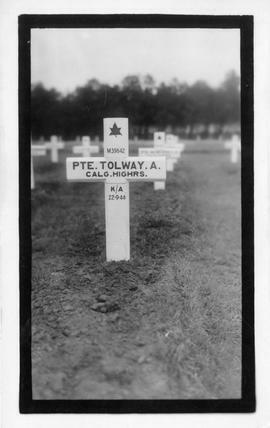 The fonds consists of Adam Tolway's attestation papers, a document giving Adam's grave location Plot 7 Row D Grave 9 in Bergen op Zoom Canadian Cemetery, and two photographs: one of him in his uniform ca. 1943, the other of his burial site in Bergen op Zoom Cemetery in Belgium.